The air mix control servo motor sends pulse signals to indicate the damper position to the A/C amplifier. The A/C amplifier activates the motor (normal or reverse) based on these signals to move the air mix damper (driver side) to any position. As a result, the amount of air passing through the heater core after passing through the evaporator is adjusted, and the temperature of the air blowing toward the driver side is controlled. The A/C amplifier communicates with the servo through a communication/driver IC and wiring assembly called the air conditioning harness. Confirm that no mechanical problem is present because this DTC can be output when either a damper link or the damper is mechanically locked. (d) Operate the driver side temperature adjustment switch. (e) Enter the following menus: Body / Air Conditioner / Data List. (f) Check the value(s) by referring to the table below. The display is as specified in the Normal Condition column. (d) Enter the following menus: Body / Air Conditioner / Active Test. (e) Check the operation by referring to the table below. Air temperature changes in accordance with each control range. (a) Replace the No. 1 air mix control servo motor (air mix control servo motor) (See page ). Since the servo motor cannot be inspected while it is removed from the vehicle, replace the servo motor with a new or a known good one and check that the condition returns to normal. (b) Check for the DTC. 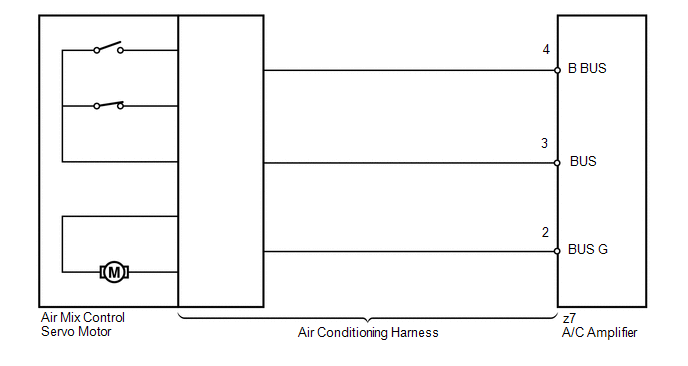 (a) Replace the air conditioning harness (See page ). Since the air conditioning harness cannot be inspected while it is removed from the vehicle, replace the air conditioning harness with a new or a known good one and check that the condition returns to normal.